Agents responded the same way they have for the last three years –that the spy is “plainly Rabbi Chaim Weisenthal,” a security consultant Ahmadinejad appointed to the position of Senior Advisor to the President three years ago. Secret Service agents point to a number of Weisenthal’s suspicious activities including his frequent visits to Jerusalem, his fondness for Yiddish phrases and his request for detailed descriptions of defense plans translated into Hebrew. Weisenthal is a sore spot for many in the Iranian government. “He’s not even trying to hide it!” Mohseni-Eje’I added. State media noted that Abed Al Aziz Muhammad, head of the Iranian Republican guard, often hits his forehead with his palm and looks up towards heaven after Cabinet meetings. “How could he not see that Chaim is always talking into the lapels of his jackets; he has a hidden microphone in there!” Muhammad said in a privately released email to a friend. 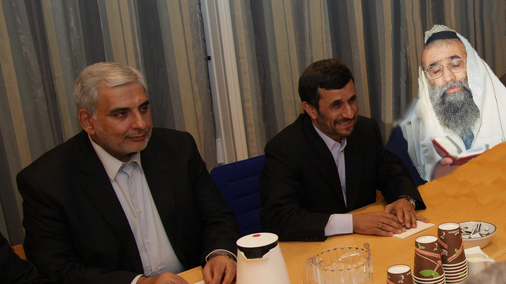 Late last evening, Ahmadinejad said he was tired of the discussion. Weisenthal was unavailable for comment, as he was too busy furiously scribbling notes in a small notepad as Ahmadinejad spoke.